Returned to Clarence Park for a second spell in December 2012 after an injury hit first half of the season with Kettering Town. 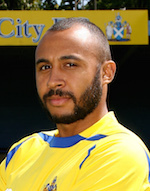 Previously with Crystal Palace, where he made six First team appearances, and Canvey Island. Was installed as the City captain.